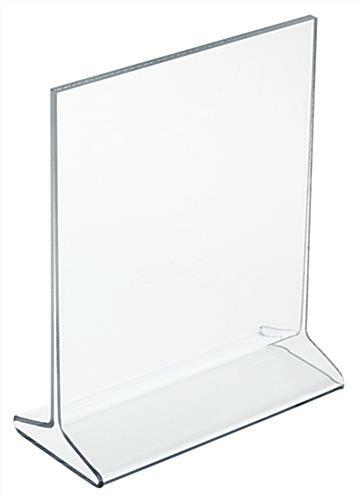 4" x 6" 4" x 9" 5" x 7" 5.5" x 8.5" 8.5" x 11" 11" x 14" 11" x 17"
This table sign holder is seen in restaurants and bars all over the world. The simple acrylic design is suitable for any type of public environment. 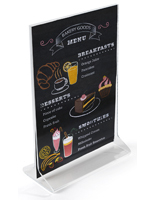 This table sign holder, also called a menu display, is easy to use and change out signage. The sides and top are open to allow users to remove old listings and insert new graphics. 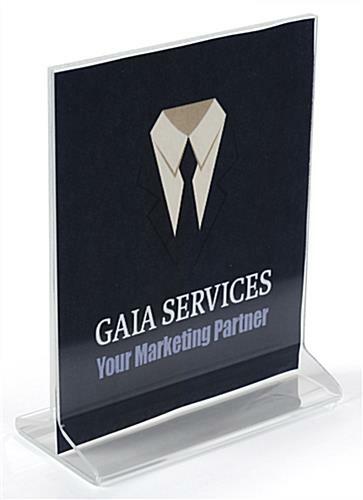 This table sign holder is commonly seen on counters in banks and hotels. 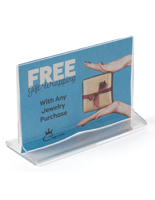 Use this acrylic frame to promote a new product or service. 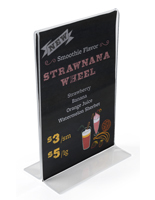 Place this table sign holder on each tabletop within a casual dining facility to advertise a seasonal drink special or new menu item. The double-sided design allows for twice the exposure. 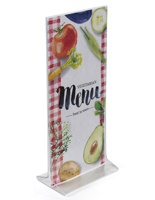 This table sign holder, menu card display, is offered in sets of twenty five or more. 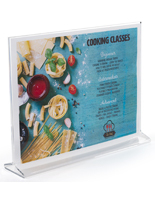 Buy this acrylic frame in large quantities to take advantage of the lower price points. Personalize this table sign holder with custom silkscreen imprinting. The colorful text or logo will further capture the attention of your patrons and increase the likelihood of your messages being seen. 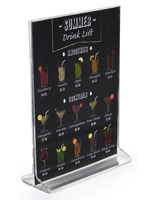 This table sign holder is a must-have for any restaurant or lounge that is looking to increase product awareness. This product was a wonderful substitute for paper table tents going on dining tables. i can just imagine that the paper tents would have been quickly ruined by food, but the small sign holders will be durable, and what's more - changeable! They are attractive and fit low enough on the table not to be a disruption to conversation, but have enough of a presence to be seen. Sherri, thank you so much for taking the time to write this excellent review! 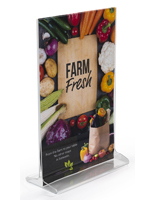 We are so happy to hear that our acrylic signs proved to be an outstanding alternative to table tents — their versatile and durability make them the perfect way to set the table with your signage. We hope you'll continue to turn to Displays2go for your display needs! Thanks for the great review, JDawg! 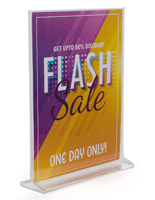 We're glad that these acrylic sign holders were perfect for your needs! Quick delivery and the perfect size!! They work perfect and don't crowd space but still get my message out!! Quick shipping well packaged, Thank you! !